1E is back on top! Ever since the announcement that 1E is being reprinted, my group has been asking the question whether we should switch completely to AD&D. We're using Labyrinth Lord and the Advanced Edition Companion, so we're pretty much playing AD&D with classic D&D stats and race-classes already - we have a Paladin, for instance. But we're not actually using the old 1E books at the table, despite one of the players (Mike) bringing up the idea of converting at every available opportunity… for months. 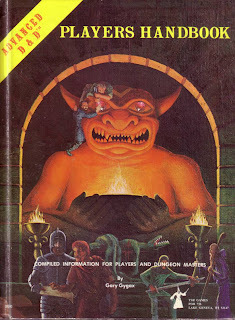 With the 1E announcement, he's been able to sway the table - the group voted to switch whole cloth to AD&D. The Trampier cover is back in the house. There are some obvious things to change - the Dwarf becomes a fighter, the Elf becomes a fighter/magic user. The more interesting question is what to do with the stats? On 3d6, the average roll is 10.5; on 4d6 drop the lowest, the average roll is 12.24 AD&D characters have an average of 10+ more points spread across their ability scores. And it shows. A fighter in classic D&D gets +1 to hit at strength 13; that same fighter needs a strength 17 to get the same bonus in AD&D. Stat inflation, baby. What have you done for converting existing "classic: characters to AD&D's higher stat requirements? The two options we discussed were re-rolling using 4d6 drop the lowest, but arranging the scores in the same relative order - so if Character A was highest in Intelligence, he would put his highest new stat back into Intelligence. The simple approach is this - since AD&D characters have much higher stats, 10 more ability points, on average, just give everyone 10 more points to spend. That fighter with a 13 strength can pump 4 points into strength, giving himself a 17 and staying on course. I'm enthused by the 1E reprinting. We don't know how limited will be the print run, and whether it will stay exclusive to hobby stores; I'd be delighted if it was successful and they chose to roll the reprints out to retail. I don't need to go looking for cynical reasons to justify the reprint; WOTC is helping the cause of getting new folks to pay attention to older games again, and that's just dandy. If your LL PCs were rolled on 3d6, I'd be kind and just give them +2 to every stat upon conversion. I'm running a campaign that started out in Swords & Wizardry, drifted through Castles & Crusades and is now delving into AD&D. We're holding on to the C&C style ability bonuses (13-15=+1, 16-17=+2, 18=+3) which makes our 3d6 heroes feel a little more confident. Giving them 4 +2s and 2 +1s would be more statistically accurate, but it might be easier to just give them a +2 to all of them. I like Higgipedia's first suggestion. The two +1s would help avoiding a "dump stat", and the +2s would even the rest out. If you were into the whims of chance/alignment/divinity, you could get them roll a d4 and add that result to each stat. Why not just convert from bonuses? If you've got ST 13 and a +1 to hit and damage, that's ST 17 in AD&D. Otherwise, leave it as-is. They're in play already, right? Let them roll 3d6 for each score: if it is higher-use new score. Lower-keep old score. At my table, I would definitely just ignore it. But if it tasks you, then I agree with Peter... any stat with a bonus penalty should be modified as little as possible to give the same bonus. Following that, adjust any stats as necessary to meet race & class min/max requirements. I'd convert from the bonuses, as well. Unless, the player's wanted to totally re-roll their stats. That last is something you could work into the game as a one-time magical effect of some place/item or another. I remember there was an appendix to convert BECMI characters to AD&D2E characters in the Rules Cyclopedia. I (stupidly) sold my copy, but if you have one it should do the trick even for B/X to AD&D1E. Wow I'm famous, actually mentioned by name. Woohoo! DHBoggs: that's cold, man. I still love the OSR stuff. But that made me laugh, too. What does it mean when the OSR is so successful at getting folks interested in old games, that the big publishers jump into the same pond? WOTC will screw it up soon enough. the OSR will still be around. After reading this I think I'm going to go through with this conversion for my Wednesday night game.